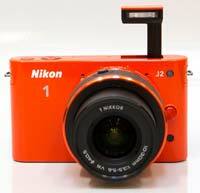 The Nikon 1 J2 is a stylish compact system camera featuring a 10-megapixel "CX" format sensor and the Nikon 1 lens mount. Boasting continuous shooting speeds of up to 60 frames per second at full resolution, Full HD video capture, an ultra-fast hybrid auto-focus system, Smart Photo Selector and a unique Motion Snapshot Mode, the portable Nikon J2 also offers more conventional shooting modes like Programmed Auto, Aperture and Shutter Priority, as well as Metered Manual and a new Creative Mode that provides a variety of photo effects and easier access to the camera's key settings. Also on board is a built-in pop-up flash with a guide number of 5, a 3 inch rear display with an increased resolution of 921k-dots, and an electronic shutter. The Nikon 1 J2 is available in white, black, silver, pink, red and orange and is priced at $549.95 / £499.99 with a 10-30mm zoom lens, or $799.95 / £649.99 in a double-lens kit with the 10-30mm and 30-110mm zoom lenses. The Nikon 1 J2 is mostly made out of aluminium with magnesium alloy reinforced parts and is therefore heavier than you would think based on its size alone, weighing in at 237g for the body only. It also feels better made than the official product shots would have you believe. With an essentially grip-less design, the Nikon J2 is very much a two-handed affair that requires you to hold the camera's weight in the left hand, clutching the lens, and use your right hand for balance and operating the controls. This is actually a good thing as it forces you to pay attention to holding the camera properly, which in turn goes a long way towards avoiding shake-induced blur in your photos. The camera's clean, minimalist front plate is dominated by the Nikon 1 lens mount. Instead of being a scaled-down version of the good old F mount, it's a completely new design that provides 100% electronic communication between the attached lens and the camera body, courtesy of a dozen contacts. Just like on the manufacturer's F-mount SLR cameras, there is a white dot for easy lens alignment, although it has moved from the 2 o'clock position (when viewed front on) to the top of the mount. The lenses themselves feature a short silver ridge on the lens barrel, which needs to be in alignment with said dot in order for you to be able to attach the lens to the camera. While this may require a bit of getting used to, it actually makes changing lenses quicker and easier. The rest of the Nikon J2's faceplate is almost empty, featuring only the lens release, a receiver for the optional ML-L3 infrared remote control, two narrow slits for the microphone either side of the lens, and an AF assist/self-timer lamp. There's no grip at all on the front of the Nikon 1 J2, although strangly the Red and Pink varieties of the J2 do have a textured grip - we've no idea why those colour-schemes benefit, and not the others. There are two ways of powering on the Nikon 1 J2. You can either use the on/off button sitting next to the shutter release or, if you have a collapsible-barrel zoom lens attached, you can simply press the unlocking button on the lens barrel and turn the zoom ring to unlock the lens, an act that causes the camera to switch on automatically. This is an ingenious solution as you need to unlock the lens for shooting anyway. Start-up takes just over a second - nothing to write home about but still decent and entirely adequate. You can frame your shots using the rear screen - there's no electronic viewfinder as on the V1 model, a key difference between the two. The new LCD screen is an upgraded three-inch, 921,000-dot display (the same screen that the V1 uses) that boasts wide viewing angles, great definition and accurate colours and improved visibility in strong daylight. We missed the EVF when using the J2 alongside the V1, as holding the camera up to eye-level helped to stabilise the lens and avoid camera shake. The control layout is rather peculiar. The Nikon 1 J2 has a small, rear-mounted mode dial that lacks most of the shooting modes that are usually found on similar dials - most notably P, A, S and M - even though it has enough room to accommodate them. These modes are available on the J2 but you have to dive into the rather long-winded and not entirely logical menu to find them. The J2's mode dial now has five settings, Motion Snapshot, Smart Photo Selector, Auto Photo, the new Creative mode, and Video. The four-way controller also has four functions mapped onto its Up, Right, Down and Left buttons; including AE/AF-Lock, exposure compensation, flash mode and self-timer, respectively. Although this isn't a bad choice of functions, the fact that there is no ISO button will doubtlessly cause a lot of photographers interested in buying the Nikon J2 to be unhappy. There's a button on the rear labelled "F" but alas, this isn't a programmable function button. In the Creative mode, it allows you to quickly choose between the various shooting modes, while in Video mode it lets you toggle between regular and slow-motion recording. There are two more important controls on the back of the camera, including a scroll wheel around the four-way pad and a rocker switch marked with a loupe icon. The scroll wheel is used to set the shutter speed in Manual and Shutter Priority modes (once you've found them in the menu, that is), while the rocker switch controls the aperture. The reason why it's got a loupe icon next to it is that this control is used to zoom in on an image to check for critical focus in Playback mode. Last but not least, there are four small buttons around the navigation pad, flush against the rear panel of the camera, including Display Mode, Playback, Menu and Delete. So what are those shooting modes on the mode dial all about? The Auto Photo mode, marked with a green camera icon, is for beginners, with a much reduced set of options on offer (image quality, image size and continuous). The Nikon J2's Scene Auto Selector is a smart auto mode in which the camera analyses the scene in front of its lens and picks what it thinks is the right mode for that particular scene. The new Creative Mode is where you will want to be most of the time. With the mode dial set to this position, you can pick your desired exposure mode from the menu. You can also choose one of the conventional PASM modes, which give you full menu access and the ability to manually set the aperture, shutter speed, or both (Program AE Shift is available in P mode). ISO and white balance can also be manually selected, but only from the menu, as already mentioned. The Nikon 1 J2 has an intriguing hybrid auto-focus system that combines contrast- and phase-difference detection in a similar fashion as the Fujifilm F300EXR did. This allows the Nikon 1 J2 to focus extremely quickly in good light, even on a moving subject. The company claims the Nikon 1 system cameras are the fastest-focusing machines in the world, and this matches our experience - as long as there's enough light. When light levels drop, the camera switches to contrast-detect AF which, though faster than on most cameras, isn't nearly as fast as the other method. It's always the camera that decides which AF method to use - the user has no influence on this. Generally speaking, the J2 will usually only resort to contrast detection when light levels are low. In good light, we were able to take sharp photos of fast-moving subjects. The Nikon J2 certainly does not disappoint here. 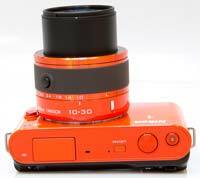 Manual focusing is also possible, although the Nikon 1 lenses do not have focus rings. If you want to focus manually, you first have to hit the AF button, choose MF, press OK and then use the scroll wheel to adjust focus. To assist you with this, the Nikon J2 magnifies the central part of the image and displays a rudimentary focus scale along the right side of the frame - but those are the only focusing aids you get. There's no peaking function available as on some rival models. 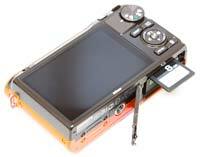 The J2 has an electronic shutter (the V1 also has a mechanical shutter). It's completely silent (the focus confirmation beep can be disabled from the menu) and allows the use of shutter speeds as fast as 1/16,000th of a second and, with the Electronic Hi setting selected, lets you shoot full-resolution stills at 60 frames per second. Note however that while this is a major achievement, it's limited by a buffer that can only hold 12 raw files. Additionally, the use of this mode precludes AF tracking - you have to lower the frame rate to 10fps if you want that -, and the viewfinder goes blank while the pictures are being taken. About the only application we can think of where shooting full-resolution stills at 60fps could really come in handy is AE bracketing for HDR imaging. At this rate, a series of 5 bracketed shots could be taken in less than 0.1 second, rendering small movements that can otherwise pose alignment problems - like leaves being blown in the wind - a non-issue. Alas, the Nikon J2 does not offer such a feature - in fact it does not offer autoexposure bracketing at all. Moving on to the video mode, the Nikon 1 J2 has some pleasant surprises here. First and foremost, the camera can be set to shoot Full HD footage, and you even get to choose from 1080p @ 30fps or 1080i @ 60fps, depending on whether you prefer to work with progressive or interlaced video. If you don't need Full HD, there's also 720p @ 60fps, which is really smooth and still counts as high definition. Secondly, you get full manual control over exposure in video mode. This is an option; you don't have to shoot in M mode but you can if that's what you need. Thirdly, you get fast, continuous AF in video mode, and it works well, especially in good light. Movies are compressed using the H.264 codec and stored as MOV files. There are separate shutter release buttons for stills and video, and thanks to this - as well as the massive processing power of the Nikon J2 - you can take multiple full-resolution stills even while recording HD video. This works the other way round too - you can capture a movie clip even when the mode dial is in the Still Image position, simply by pressing the red movie shutter release. We've found that in this case the camera will invariably record the video at 720p/60fps. In addition to being capable of shooting regular movies in HD quality, the Nikon 1 J2 can also shoot video at 400fps for slow-motion playback. The resolution is lower and the aspect ratio is an ultra-widescreen 2.67:1, but the quality is adequate for YouTube, Vimeo and the like. These videos are played back at 30fps, which is more than 13x slower than the capture speed of 400fps, allowing you to get creative and show the world an array of interesting phenomena that happen too quickly to observe in real time. The Nikon J2 goes even further by offering a 1200fps video mode, but the resolution and overall quality is too poor for that to be genuinely useful. The second icon on the mode dial stands for Smart Photo Selector. This feature allows the camera to capture no less than 20 photos at a single press of the shutter release, including some that were taken before fully depressing the button. The camera analyses the individual pictures in the series and discards 15 of them, keeping only the five that it thinks are best in terms of sharpness and composition. This feature can be genuinely useful when photographing fast action and fleeting moments. The Nikon J2 stores photos and videos on SD/SDHC/SDXC memory cards, and supports the fastest UHS-I speed class. The camera runs on a smaller EN-EL20 battery to its V1 big brother, and is consequently capable of producing considerably less shots on a single charge, managing around 230, although it does help to make the camera body more compact. The camera's tripod socket is made of metal and is positioned in line with the lens' optical axis. This also means that changing batteries or cards is not possible while the J2 is mounted on a tripod, as the hinges of the battery/card compartment door are too close to the tripod mount. So, how did we like using the Nikon 1 J2? On one hand, we liked it a lot. In good light, its auto-focus system is indeed faster than pretty much anything we've used so far, being able to track and lock focus on a range of truly fast-moving subjects, and yielding a lot of sharp images in situations where our keeper rates have never been very high. Additionally, its high-speed continuous shooting modes have allowed us to capture interesting moments that we'd have surely missed if we had used a slower camera. The built-in pop-up flash proved more useful that its modest guide number might suggest, with the clever design minimising red-eye. On the other hand, the Nikon J2 has its share of frustrating idiosyncrasies starting with the user interface that forces you to dive into the menu to access functions as basic as exposure mode, ISO speeds and white balance. While Nikon obviously cannot add extra buttons to a finished product, they could at least make the "F" button customisable via a firmware update. Also, while there is a dedicated button for exposure compensation - which is a good thing - we did not find a way to activate a live histogram, even though it would have made exposure compensation a lot more useful and easy to use. Again, this could probably be fixed in firmware. We also missed the V1's smooth, high-resolution electronic viewfinder, especially in bright light or when using the telephoto lens which doesn't lend itself well to being held out at arms length. The J2 only has a glass dust shield as it's defense against unwanted debris, rather than the more proactive sensor cleaning unit that the V1 offers, and the smaller battery means that you'll need to buy an extra one to get through a day's heavy shooting. The lack of an accessory port means that almost none of the Nikon 1 accessories are compatible with the J2, such as the external flash and GPS unit. 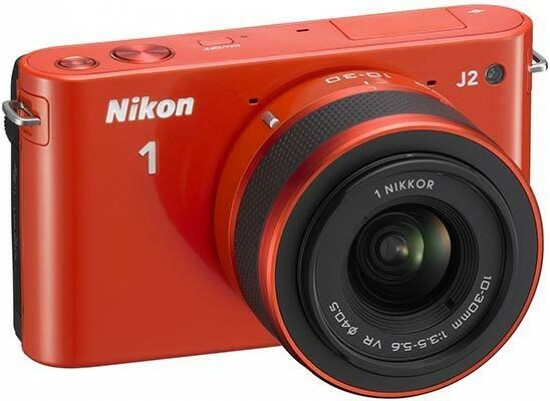 All things considered, the Nikon 1 J2 is a small and compact, high-performance system camera that like its big brother could use a few tweaks to its user interface to better suit the needs of serious amateurs. The intended target market of casual users will like it for its sheer speed, built-in flash, compact size and the fun features it offers. Let us now see how the Nikon 1 J2 fared in the image quality department.